The Cultural Analysis Summer Academy (CASA) came into existence in 2003 as an international forum that seeks to discuss the shifting functions of academia and the scholar in a globalized society. Until now CASA organized two meetings to provide a platform for these discussions. Two years ago people from seventeen countries all over the world engaged in the discussions under the broad headline of 'Acting - Spectating'. The meeting proved to be successful and created on-going debates that have resulted in an e-journal and a proposed book publication. In 2005 a second meeting was organized that focused on the intersection between academic research and activism by discussing three thematic threads: borders, markets and movement(s). The leftist tendency of embracing change as intrinsically positive, as if all transformations were emancipatory, veils two important facts. First of all, it presents the world as manageable. While change is inevitable it is not always the result of rational choices within collective action processes. Secondly, when human agents attempt to give change a certain direction, they still need to take into consideration that the effects of their actions cannot always be predicted and anticipated, but are subject to contingent factors and can take surprising turns. The unpredictability inherent in a project of transformation make it necessary that change becomes a reflexive and ongoing process. Dialogic processes for change in a world that is not manageable cannot flourish when one departs from the concept and practice of 'directing change'. 'Vanguardism' is no valid option for a participatory collective process. Therefore, we would like to speak about constructing change, which refers to a collective participative process that involves the articulation of differences by creating permeability and mutual contamination between different struggles and ideas. Once we accept that change does not occur by itself but always due to human intervention we need to question the agent of change and the concept of agency. We would like to question the Marxist concepts of ‘vanguardism’ and ‘false consciousness’ in terms of ’directing’ social change so as to create a project that looks for more equal and inclusive relations. Instead of directing change, we would like to discuss the possibilities and strategies for collective emancipatory projects. What becomes much more important than an exact answer to the question of what direction to go (which is, ultimately, an individual concern), is the question of how to organize collective emancipatory change. Therefore, we would like to open up a discussion about constructing change, which refers to a participative process that involves the articulation of differences by creating permeability between different struggles and ideologies. How does desire relate to social change? How can reflections on our?own desires for change and its implications be developed? Can desire?be changed or directed? What is the role of desire in research? Can desires for alternatives help to shape an effective research strategy? What is the role of utopian writing for the stimulation of social change? What can be considered as utopian movements? What are the utopian aspects of social movements and knowledge construction? How can art contribute to emancipatory change? Is art merely reflecting social change, or can it be transformative in itself? How are art, knowledge and desire interrelated? How should we imagine the agency and autonomy of art in the age of global culture industries? Can art be a form of direct action? In what way is art related to the social? What is the role of the artist, and what is the role of the public in both the production and experience of an artwork? How can we discuss social responsibility of the artists? In what ways can knowledge be used for social change towards more?inclusiveness and emancipation? Which agents or parameters determine different types, modes and sites of knowledge production and transmission, knowledge hierarchies, the organization of knowledge and of academia? What alternatives are available concerning the production, distribution/sharing and use of knowledge? What is the role of education in processes of transformation? What kind of interruptions and interventions are useful for reaching?emancipatory transformation? How and by whom are direct action interventions carried out and to what ends? What kind of knowledge is produced by direct action? Can direct action also be used for knowledge construction and the interruption of hegemonic academic practices? Can we talk about "aesthetics" of direct action as a way of politicizing and mobilizing aesthetic experience? The format of the CASA meeting is as crucial as its content. We want to ask all of you to engage in a construction of interactive spaces that contribute to constructing emancipatory change that is inclusive. Interactivity, here, means acknowledging that knowledge construction and knowledge transmission are not one-directional but rather collective processes. Thus participants of all kinds (presenters, discussants, facilitators, technical assistants, and organizers) should actively engage in collaborative processes rather than in a mere conveying of knowledge. We are open to alternative formats – from workshops to performances - that would open spaces for participation and collective production. Inclusiveness, here, means open to variety. 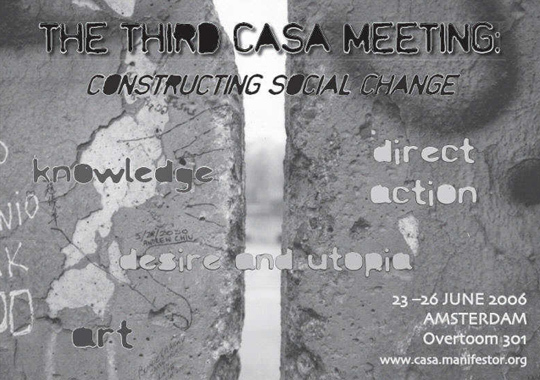 We want a large diversity of contributions to the CASA meeting by inviting academics, artists, artist projects and collectives, utopians, utopian writers, non- institutional intellectuals, activists engaged in direct actions, and other interested individuals to share and exchange thoughts and practices. We also anticipate a diversity of practices to open debate and reflection. CASA 2006 can be a continuum of debating, intervening, thinking, reflecting, inspiring, inventing and constructing inclusive emancipatory initiatives.